LOUISVILLE, Colo. (Mar. 30, 2017) — Life Time Tri, America’s Premier Triathlon Series, is proud to announce a new partnership with global humanitarian organization Save the Children throughout the 2017 event season. Through the alliance, Life Time Tri will donate race entries for each event to Save the Children which has committed to challenge its donor base to experience the triathlon lifestyle for themselves – all while generating funding for children in need. Save the Children is the leading international children’s relief organization, working in 120 countries including the United States. They do whatever it takes to ensure that all children get access to what they deserve — a healthy start, the opportunity to learn, and protection from harm. The relationship represents much more than a preferred charity partnership. It allows Life Time Tri an opportunity to grow the sport of triathlon by connecting with one of the world’s largest philanthropic networks. Save the Children and Life Time Tri will team up with several celebrity athletes to race on Team Save the Children. Initial celebrity participants include Tony Kanaan of Indy Racing League (South Beach Tri), Scott Braun , Eric Byrnes, and Heidi Watney of MLB Network (NYC Tri) and Chikage Windler of CBS Austin (CapTex Tri). 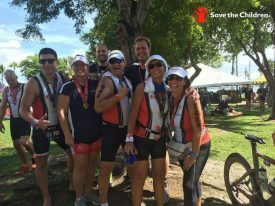 Participants who commit to triathlon with Team Save the Children are asked to raise a minimum of $500 for the organization. Beyond donated race entry, athletes receive a variety of training instruction and coaching support, team merchandise, VIP race amenities and exclusive, non-competitive swim starts. The relationship links Save the Children with Life Time’s eight short-course triathlons, each held in iconic U.S. destinations. The Life Time Tri season kicks-off this weekend with the South Beach Triathlon (April 2). Announced last week, the new series finale will be hosted in San Diego (Oct. 15). To learn more or register for any 2017 Life Time Tri event, visit: www.lifetimetri.com. Save the Children believes every child deserves a future. In the United States and around the world, we give children a healthy start in life, the opportunity to learn and protection from harm. We do whatever it takes for children – every day and in times of crisis – transforming their lives and the future we share. Follow us on Twitter and Facebook.